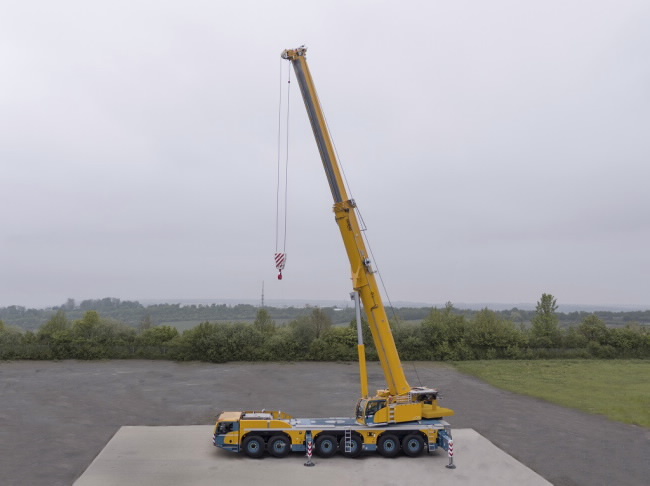 SCHOLPP is extremely happy with the quality and powerful performance characteristics of Demag all terrain cranes, and it shows: The Stuttgart-based company, which was founded in 1956, ordered three cranes from the Demag Zweibrücken factory in December 2017. The crane service provider is adding another Demag AC 220-5, as well as a Demag AC 300-6 and a Demag AC 700-9, to its fleet. “Having a customer order three Demag cranes at the same time is not something we experience every day. However, it shows us that the market is well aware of the quality of Demag products and that this is driving increased adoption,” Michael Zieger, who was in charge of the sales negotiations with SCHOLPP as the responsible Terex Cranes sales manager, reports. The SCHOLPP fleet features a total of 90 machines, including more than 60 cranes. Guided by its “Precision work for big things” slogan, SCHOLPP offers a range of comprehensive crane and transportation services that have made it a key player in infrastructure construction and expansion projects. With over 10,000 crane and transportation projects per year, more than 150 employees, and five branch offices in Stuttgart, Leonberg/Böblingen, Karlsruhe, Heilbronn, and Ludwigshafen, the company is a leading partner for the economy, number one in Baden-Württemberg, and the epitome of precision and professionalism in the construction, industrial, trade, automotive, petrochemical, and utility sectors.